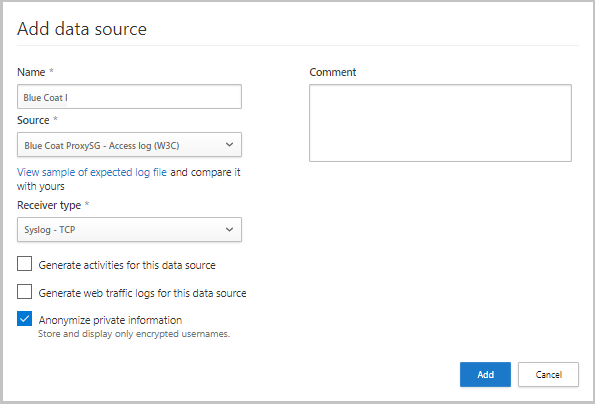 You can configure automatic log upload for continuous reports in Cloud App Security using a Docker on Ubuntu or Red Hat Enterprise Linux (RHEL) in Azure. This article describes how to set up the automatic log upload. Network bandwidth - Your network bandwidth determines the log upload speed. I/O performance of the virtual machine - Determines the speed at which logs are written to the log collector’s disk. The log collector has a built-in safety mechanism that monitors the rate at which logs arrive and compares it to the upload rate. In cases of congestion, the log collector starts to drop log files. If your setup typically exceeds 50 GB per hour, it's recommended that you split the traffic between multiple log collectors. Go to the Automatic log upload settings page. a. In the Cloud App Security portal, click the settings icon followed by Log collectors. For each firewall or proxy from which you want to upload logs, create a matching data source. a. Click Add data source. b. Name your proxy or firewall. c. Select the appliance from the Source list. If you select Custom log format to work with a network appliance that isn't listed, see Working with the custom log parser for configuration instructions. d. Compare your log with the sample of the expected log format. 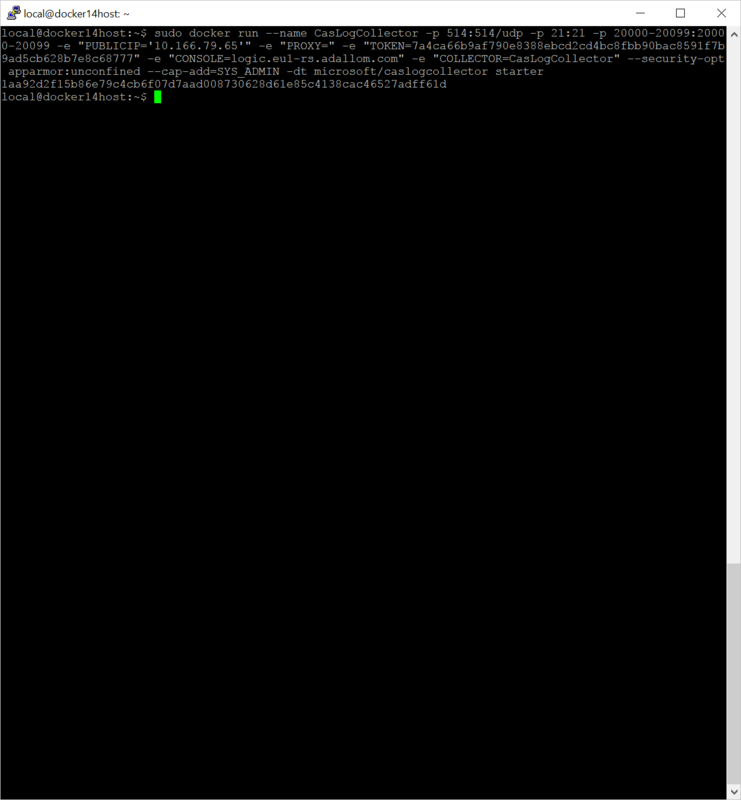 If your log file format doesn't match this sample, you should add your data source as Other. e. Set the Receiver type to either FTP, FTPS, Syslog – UDP, or Syslog – TCP, or Syslog – TLS. Integrating with secure transfer protocols (FTPS and Syslog – TLS) often requires additional settings or your firewall/proxy. Monitor the status of each device separately, for investigation purposes. Explore Shadow IT Discovery per device, if each device is used by a different user segment. Go to the Log collectors tab at the top. a. Click Add log collector. b. Give the log collector a name. c. Enter the Host IP address of the machine you'll use to deploy the Docker. The host IP address can be replaced with the machine name, if there is a DNS server (or equivalent) that will resolve the host name. 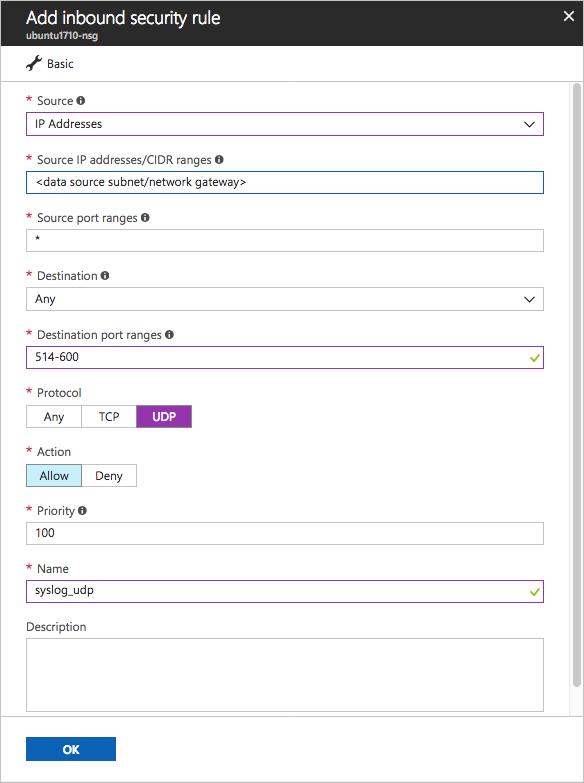 d. Select all Data sources that you want to connect to the collector, and click Update to save the configuration see the next deployment steps. A single Log collector can handle multiple data sources. Copy the contents of the screen because you will need the information when you configure the Log Collector to communicate with Cloud App Security. If you selected Syslog, this information will include information about which port the Syslog listener is listening on. Further deployment information will appear. Copy the run command from the dialog. You can use the copy to clipboard icon. Export the expected data source configuration. This configuration describes how you should set the log export in your appliances. The following steps describe the deployment in Ubuntu. The deployment steps for other platforms are slightly different. Create a new Ubuntu machine in your Azure environment. a. In the machine view, go to Networking select the relevant interface by double-clicking on it. b. Go to Network security group and select the relevant network security group. Go back to the machine and click Connect to open a terminal on the machine. Change to root privileges using sudo -i. 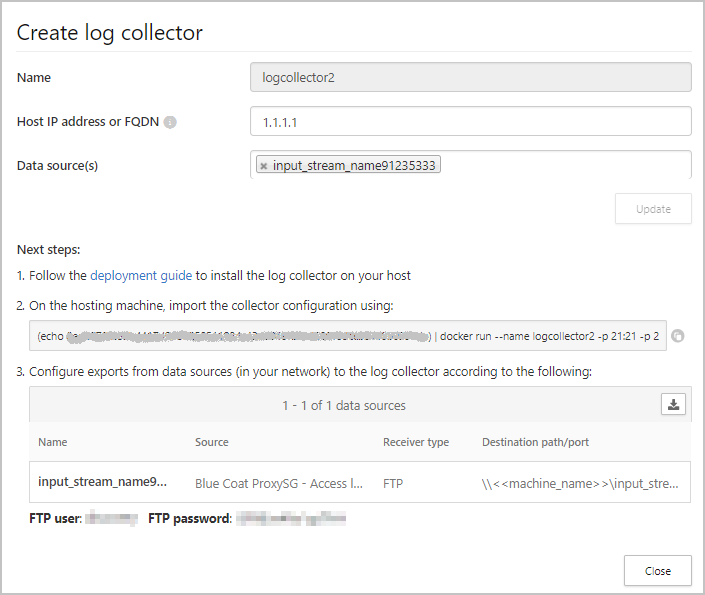 Run the command to deploy the log collector. 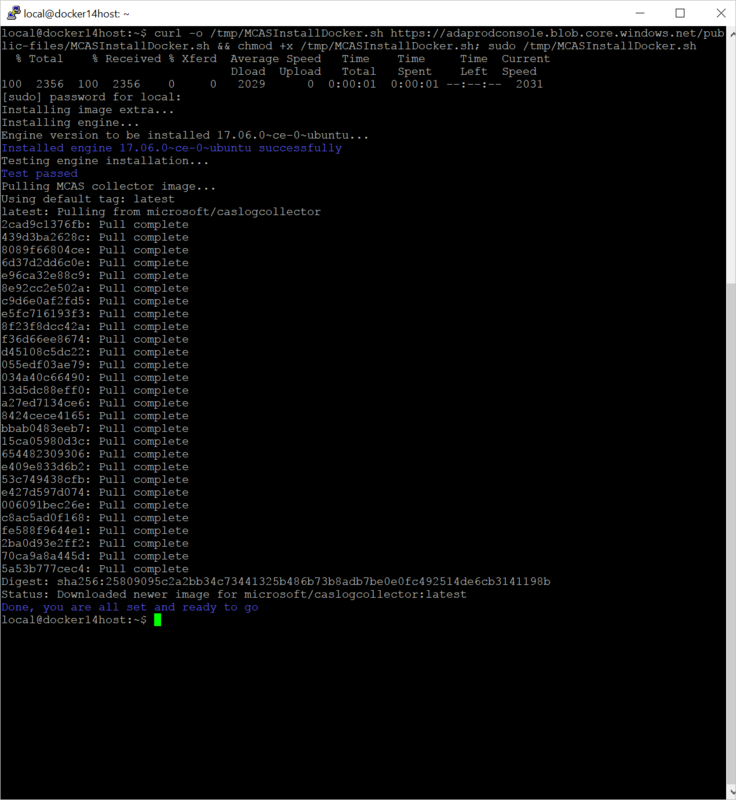 To verify that the log collector is running properly, run the following command: Docker logs <collector_name>. You should get the results: Finished successfully! Check the collector status in the Log collector table and make sure the status is Connected. If it's Created, it's possible the log collector connection and parsing haven't completed. You can also go to the Governance log and verify that logs are being periodically uploaded to the portal. If you have problems during deployment, see Troubleshooting Cloud Discovery. Verify that the logs are being uploaded to Cloud App Security and that reports are generated. After verification, create custom reports. 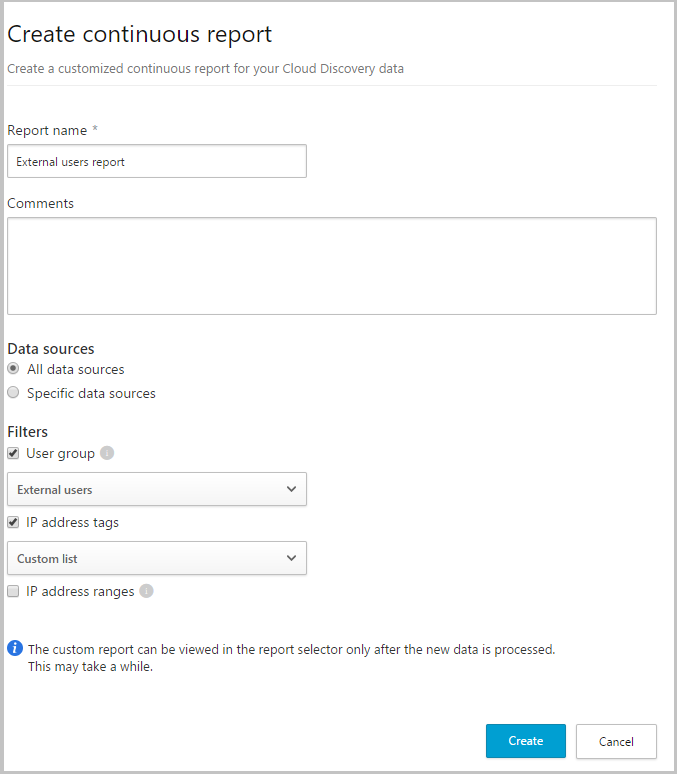 You can create custom discovery reports based on Azure Active Directory user groups. For example, if you want to see the cloud use of your marketing department, import the marketing group using the import user group feature. Then create a custom report for this group. You can also customize a report based on IP address tag or IP address ranges. 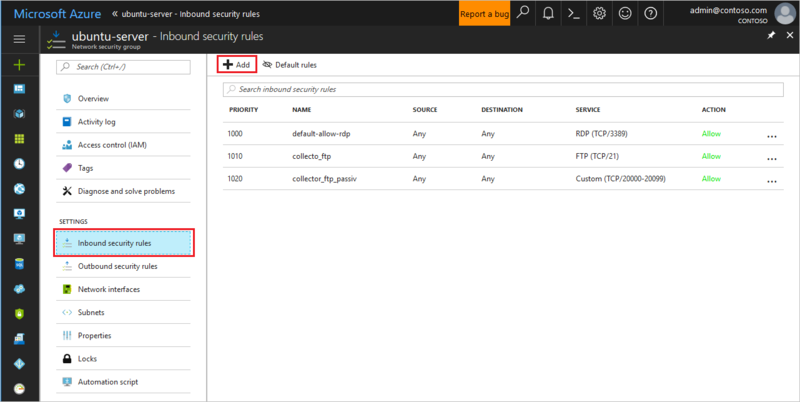 In the Cloud App Security portal, under the Settings cog, select Cloud Discovery settings, and then select Continuous reports. Click the Create report button and fill in the fields. Under the Filters you can filter the data by data source, by imported user group, or by IP address tags and ranges.